In the Second Chance Act of 2007, Congress found that although close family ties represent one of the most effective resources to help offenders in prison transition to society successfully upon release, prison administrators under utilize the resource of families. As a long-term prisoner, I know that Congress missed the point. Administrators not only fail to underutilize families as a resource, they support prison policies and a culture that erects obstacles to block rather than help offenders nurture family ties. We need prison reforms that will facilitate efforts by prisoners to nurture family and community ties. One recent example concerns my young friend, Jeff, who serves time with me inside a minimum-security federal prison camp. Jeff is in his late 20s. He is three years into a prison term that will keep him incarcerated for seven more years. Jeff is the father of two children, Brandon and Priscilla. When Jeff began serving his sentence, he was not married to Gabriella, the children’s mother. Gabriella, however, stood committed to strengthening her family with Jeff. She wanted to marry him. Prison administrators did not support the idea. He submitted his request through his counselor. The counselor then passed Jeff’s request on to the camp administrator. The camp administrator determined that with seven years remaining to serve on his sentence, Jeff had too much time ahead of him to marry. Administrators abused their discretion by denying Jeff permission to marry. Jeff felt discouraged by the news. As a man who lacked knowledge of the legal system, he did not know how to respond. I heard about Jeff’s problem and offered to help. Although Jeff was unaware, I knew that the U.S. Supreme Court had made rulings that supported a prisoner’s constitutional right to marry. Jeff did not need permission from a camp administrator. As an American citizen, he retained the right to marry. The Supreme Court had found that inmate marriages were expressions of emotional support and public commitment. In addition, many religions recognized that marriages have spiritual significance. Finally, marital status was a precondition to the receipt of several government benefits, including property rights, and legitimization of children born out of wedlock. Thus, the Supreme Court held that inmates have a constitutionally protected right to marry. We need prison reforms that erase a culture of confinement that blocks and obstructs family ties. When I began helping Jeff with administrative remedy filings to challenge the camp administrator’s abuse of authority, the administrators relented. After I helped Jeff file a series of objections to advance his argument, the staff granted Jeff permission to marry. Still, they did not make it easy. The chaplain at the prison, the counselor at the prison, and the case manager at the prison all tried to influence him. They wanted to convince Jeff that he was making a bad decision. With so much time to serve, they told him that his marriage was unlikely to last and that a marriage would only make his time more difficult. The chaplain chose not to assist Jeff. He instead instructed him to find a member of the clergy or justice of the peace from the local community to perform the ceremony. Only through continued administrative objections could Jeff obtain the chaplain’s cooperation in performing the wedding ceremony. Jeff’s persistence enabled him to overcome the obstacles wrought by prison administrators to his marriage, though only prison reforms could help him nurture family ties. Policies introduced under President Bush’s misguided administration restrict federal prisoners from talking on the telephone for more than an average of ten minutes per day. Such unnecessary limitations require Jeff to choose between talking with his wife, his son, his daughter, and members of his extended family. The constraints preclude him from using his precious allotment of monthly phone minutes to build bridges to society by talking with friends and mentors. With Jeff’s schedule of seven more years to serve, prison rules exacerbate the struggle for Gabriella. She is left to rear her children without the presence of Jeff in their home. Their children suffer. Meanwhile, as Jeff grinds his way through more than 2,500 additional days of confinement, existing prison policies will alienate him further from family and community. We need prison reforms that will encourage prisoners to earn graduated increases in freedom. As a start, such reforms ought to allow prisoners to earn additional access to telephone time so they can nurture ties with family and community. Such prison reforms will facilitate offenders who strive to build networks of support that will help them transition into society as law abiding citizens. Prison reforms will lower recidivism rates and thus make society safer. We need prison reforms now. In your article, “Prison Policies Block Families from Nurturing Ties with Loved Ones in Prison”, you indicated that many prisoners are held back from their families because of so many rules. I was surprised and saddened to hear that one of your fellow prisoner’s was discouraged from his counselor to marry the mother of his children, even though they have no right to stop a prisoner from getting married. After reading this article I wonder, is there anyone within the prison staff who does encourage and promote a positive lifestyle with the prisoner’s? I was also curious to know if it was difficult for you to get your degree’s in prison because from reading this article, it seems to me that not many people are encouraging the prisoner’s do well or to make a poistive change in themselves. Thank you for the time you are taking to respond to my class. I have really enjoyed reading your articles, as well as your book. You have given me a different perspective of prison life and everything that goes on inside. I appreciate your article. My husband is in Morgantown for 46 months. We have a 14 month old and are expecting our second child in April. Do you have any recommendations on a furlough for childbirth? I also had a question regarding receiving your graduate degree in prison. My husband has his bachelors in finance and was wanting to get his MBA while in prison. I am having a hard time finding colleges that will do a program by mail correspondence. Any help would be appreciated. Thank you. In your article entitled, “Prison Policies Block Families from Nurturing Ties with Loved ones in Prison,” you indicated that they need prison reforms that will facilitate efforts by prisoners to nurture family and community ties. Aslo how the staff members within the prison discourage prisoners from strengthening these ties. My question to you is, if you did not helped Jeff or was unsuccessful in doing so, do you think Jeff would have let his frustration get the best of him? In other words, what do you think the outcome would have been had you not assisted Jeff in his journey? My last question is, why do you think Bush and his administrators only allow 10 minutes of phone time to federal prisoners? Thanks for visiting our site. I’ve mailed your comments/questions to Michael. He’ll write you back, and I’ll post his response as soon as I have it. Thank you for writing, we appreciate your interest in Michael’s work. In your article entitled “Prison Policies Block Families from Nurturing Ties with Loved Ones in Prison” you talked about Jeff, the inmate who was trying to get married to the mother of his children while incarcerated. I found it a bit surprising that a chaplain would purposely try and stop an inmate from getting married, when it showed that he was emotional stable and ready to think beyond himself and whatever crime he committed. My first question to you is how you feel family ties and commitments, such as marriage and children, later effect whether or not a prisoner will commit any crimes again? Also do you think that only prison staff that believed in rehabilitating prisoners should be hired to facilitate the prisons? I would think that if prisoners are going to be released into society, they should be helped and supported by people who care. In your article entitled “Prison Policies Block Families from Nurturing Ties with Loved Ones in Prison” you indicated that in summary of the article that due to the lack of administrative support with family ties it initially creates greater distance from prisoners reforming to a law abiding citizen. 1. With the current system should prisoners be allotted more freedoms when the current structure of prison should be considered hard punishment for what has been done. 2. What freedoms should be allowed to men that cannot handle social structure, which has never been more relevant than the illustrated stories in your book. 3. What is your common belief if you were not in the position that you are in to give more time and money to the prisoners and how should reform be established pertaining to families to created better post-prison citizens into society. I am not coming of as rude or one sided it is just that in today’s society I just believe that rights of the convicted should be limited to minimal actions to truly enforce harsh time. By allowing ten more minutes on the phone it would just add to the criminal society which was illustrated by the stories in your book. Finally, if reform should happen I believe that it should be for minor criminal convicts. Your book was a pleasure and truly illustrates what is blind to today’s society I wish you well and am looking forward to talking to you about other issues while in Dr. Torres class. In your article entitled, “Prison Policies Block Families from Nurturing Ties with Loved ones in Prison,” you talked about your young friend Jeff, who had so much trouble just trying to get married to his significant other. I am sorry to hear about that, and was actually quite disappointed as well. This is my first article that I am reading from your website and I can tell you now, it wont be my last. I am a student from Dr. Torres’s class and I just have some questions for you that maybe you could reply to so I can use them for my paper. I am very family oriented so I see how it could be very very tough for Jeff but at the same time I believe that criminals who hurt (physical, mental, etc) other people should be restricted to certain freedoms. I am not saying Jeff did something to someone else nor do I want to be disrespectful, I just would like to know how you feel? but I do believe prisoners who just made a simple mistake and our young and naive should be treated fairly if not equal. Also, is their other fellow prisoners that help each other out, or go out of their way to help? cause to me that was a respectful deed that you didn’t even have to do. How do you feel about the divorce rates when an inmate goes to prison? Because is it not much harder to keep a bond like marriage together? I see Jeff’s side but I also see the other as well. I know I am asking a lot of questions but I am very curious. Last one, I promise. How, where, do we start to help prisoners get the freedoms (from college degrees to being able to see and talk to their family more often) they deserve. I would like to know how you feel cause I would not know where to begin. I do agree with you though. We do need prison reform now, I just don’t know about giving it to prisoners who commit crimes to others and bring pain to the families and society. Hope you can reply and thanks for taking the time to read it. My name is Adela and I am a criminal justice major at California State University, Long Beach and a student of Dr. Torres. After reading your article, “Prison Policies Block Families from Nurturing Ties with Loved Ones in Prison” it really close to home, since my father did time in state prison for a long time during my childhood. He is out of prison now and our relationship is not as close as I would like it to be. I feel like I barely know him since he wasn’t really around and I blame the correctional system for it. Do you feel that the correctional system needs to allow more visiting time for the prisoner with their children so they do not lose the father figure in their lives? For example, more visiting time (like play dates), more time making telephone calls, etc. What might you like to see changed in regards with prisoners interacting with their children? Thank you for taking the time in reading and responding to my questions. Thank you for giving me this opportunity to contribute to your understanding of the criminal justice system. I am sorry to have read about the struggles your own family had with the system, and it is precisely your experience that convinces me of the need for prison reforms that would enable prisoners to nurture family ties. In the Second Chance Act, Congress made findings that showed prisoners with strong family ties were the least likely to recidivate. That’s why prison reforms make good sense. The basis would not be to make prisons suffer, but to lower recidivism rates and to encourage more prisoners to prepare for law-abiding lives upon release. A prisoner with a strong family stands more reason to adjust to prison, and to society in positive ways. The initial reforms I would like to see would open access for prisoners to communicate with family and positive role models. Administrators should encourage rather than restrict prisoner efforts to talk on the phone, to visit, and to communicate in writing. If necessary, administrators could condition telephone access, visiting, and e-mail on productive adjustment patterns. These changes would not endanger society nor would they burden taxpayers. On the contrary, such reforms would lead to safer prisons and stronger family ties. In your article “Prison Policies Block Families from Nurturing Ties with Loved Ones in Prison” you mention how it is unconstitutional to not allow an inmate to marry. Also, you mention that strong family ties are a positive influence on an inmate in and out of prison. The example with Jeff was very interesting, as he faced various barriers that encouraged him against marriage in prison. It was unbelievable that although the Supreme Court ruled that inmates can marry, the chaplain initially refused to marry Jeff. The prison administration should be in favor of anything that can be of positive influence for the inmates. Now, my questions to you are: As an inmate who married while in prison, did you face any negative influence or barriers when you tried to marry your wife Carole? Was there anyone in the prison, such as administrators or counselors that encouraged you or helped you in the process? In this article, you focus mainly on family ties concerning marriage, and it has been been proven that children live a healthier lifestyle when both parents are a part of their life; what is you view on that? How can the prisons reform to allow an inmate to be a parent/husband/son/brother? Family ties have a positive effect on inmates, how much can be done to help strengthen those ties? I thank you for taking your time to provide us with your insight. 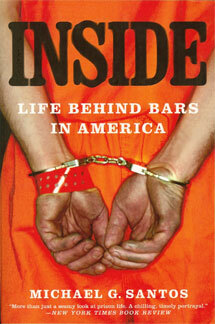 I really enjoyed reading this article, the article “They’re Prison Guards, Not Correctional Officers,” and your book. I also thank you ahead of time for answering my questions.